Let's face it, some women are "plain janes" but I'm not one of them. Now don't get me wrong, I love my simple cute days. It feels great to throw on a wife-beater, leggings and still be a princess!!! However, I prefer to be simple "chic." It doesn't take much, those same leggings and wife-beater paired with standout jewelry can revamp the entire look. So when is it too much to be fashionable? Well in my opinion never. But in my BF's opinion at a Nats game. 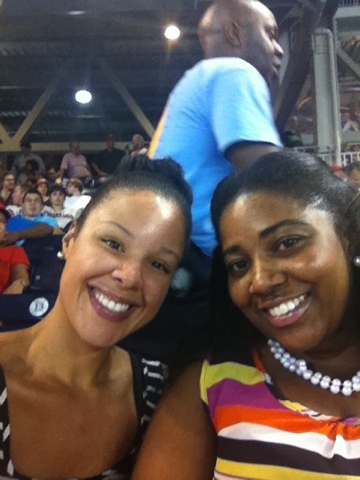 I got chewed out for rocking pearls to yesterday's Washington Nationals game against the Philadelphia Phillies. And to add insult to injury I was warned to never try that at the Baltimore Ravens game!!! BF was actually serious. My response - I'm a diva everywhere that I go! Plus the Ravens is football, you won't see my pearls underneath of my hoodie!